It was a long day of walking before I arrived at Demesne Farm Campsite and Bunkhouse in Bellingham. Since starting in Edale I’d walked over 200 miles on the Pennine Way, although the exact number was unclear; way back on my fifth day I’d taken a train and skipped over about 20 miles of the trail (we can talk about the agony of blisters another day), but I’m sure I added those miles back on with all the times I thought I was on the Pennine Way but actually wasn’t (we can talk about that another day, too). This was the end of a 22-mile day, my 13th of the Pennine Way, with only two stages remaining. Now I was nearing the end, and my day of walking from Greenhead to Bellingham was one of my absolute favorites. I knew it would be a long one and I told myself that I should get an early start, but a cooked breakfast at the Greenhead Hotel and Hostel was too appealing to pass up. It was 8:30am by the time I headed out, and for the first time since the very beginning of my journey, I walked under gray skies. The UK was experiencing a heat wave, and I’d just had 11 straight days of blue skies and sunshine, so the gray, rolling clouds were a welcome change. Almost immediately after leaving Greenhead, the path leads to the ruins of Hadrian’s Wall, and continues by the wall for the next 8 miles. 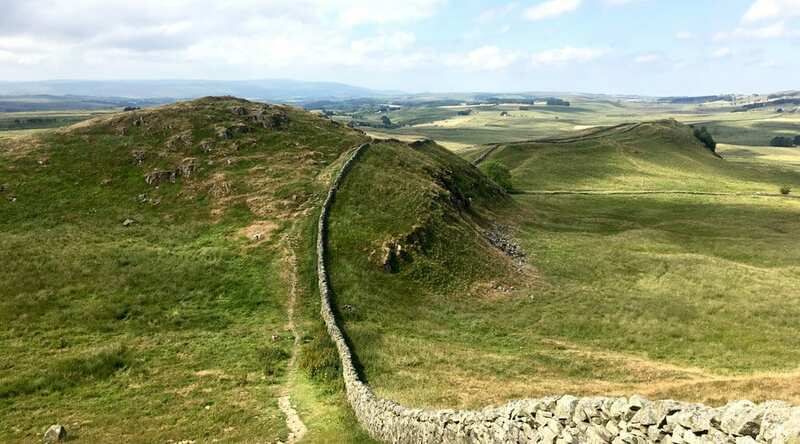 This is an extremely well preserved section of the defensive wall that Emperor Hadrian gave orders to build in AD122; the entire thing runs east to west for 73 miles in the border country of England and Scotland, and Pennine Way walkers are in for a treat. I’d walked Hadrian’s Wall Path the year before in early spring, but still found myself lingering and taking dozens of photos. The clouds burned away, the sky turned a brilliant shade of blue, and it felt as though I had most of the trail and the wall to myself. But as soon as I turned away from the Hadrian’s Wall to continue on the Pennine Way, I felt like I was back where I belonged. After 200 miles, I felt connected to the Pennine Way. It hadn’t always been kind to me but I didn’t take it personally, because this is part of what it means to walk any long-distance path. The endless ascents and knee-crushing descents, the swollen feet and blisters, the hundreds of times you need to navigate fences and stiles, the punishing rain, the relentless sun; you learn to carry on. And then you learn to love it, all of it. The stretching and vast moors, the clusters of sheep, the deep green hillsides and the purple foxgloves, stone slabs that stretch on for miles and duckboards that protect you from the bogs. I walked and I walked that day; I climbed over the stiles and crossed the stone slabs, I rescued a lamb stuck in a fence and wore a hat to shield my face from a hot afternoon sun. I stopped for a cold drink and a biscuit in a trail angel’s shed (only one example of the wonderful generosity I found along the way), and I climbed up and down hills and then finally arrived in Bellingham. Bellingham is a small market town in Northumberland that sits on the north bank of the River North Tyne, and the Pennine Way follows a lovely little stretch along the river before it arrives in the village. And despite its small size, I found everything I could possibly want: a grocery store, a bakery, a country store, a post office, a couple of banks with ATMs, a café, a tea room, a few pubs. And then, only 100 meters past the village center, was my lodging for the night: Demesne Farm Campsite and Bunkhouse. I arrived at the same time as a couple other Pennine Way hikers, and the three of us were greeted warmly and given a tour of the site. The bunkhouse used to be a traditional Northumbrian stone and slate barn, and while the building has been thoroughly updated it also retains an old charm. There are three gender-separate bunk rooms sleeping 15 (all named after nearby hills in the area! 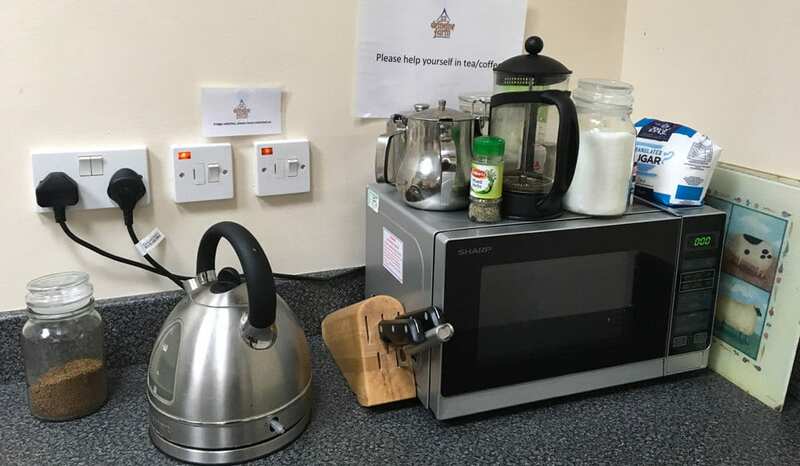 ), a large lounge with leather sofas, a modern kitchen with every appliance and gadget you could hope for, a drying room, a row of outdoor picnic tables with a view of the setting sun. Also: wi-fi! What a treat. Rather than find a restaurant or pub in town, I took advantage of the well-stocked Co-Op grocery store and returned to the bunkhouse with a bag full of food: dinner, as well as breakfast, snacks and lunch for the following days (Bellingham is the last place to stock up on food for the final stages of the Pennine Way). As I finished my dinner I was joined in the kitchen by half a dozen bikers who were cycling the Reivers Coast to Coast Route and also staying in the bunkhouse. They made mugs of tea and asked lots of questions about my walk, and I happily answered. “Only two days left!” I told them, and I thought about this as I fell asleep (lucked out once again and was the only one in my bunk room). This close to the end, I wanted to savor every moment. The hostels used at the beginning and end of this days walk are Greenhead Hostel run by the Greenhead Hotel in Greenhead and Demesne Farm Bunkhouse near Bellingham. 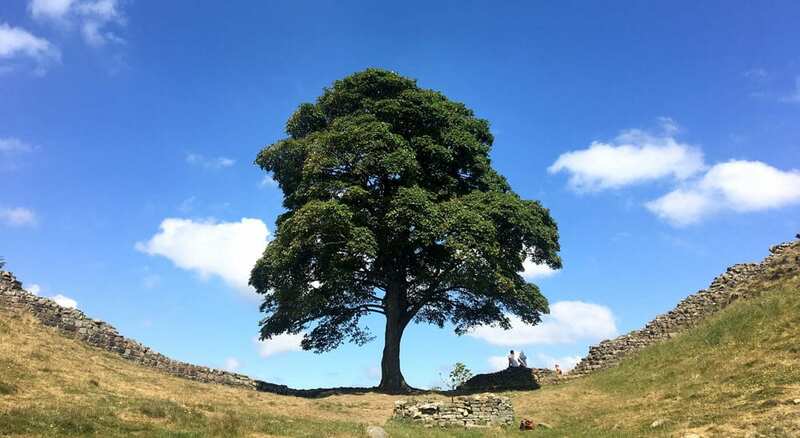 Here are pages showing the hostels and bunkhouses on the Pennine Way and on Hadrian’s Wall and here is a complete list of hostels in Northumberland.